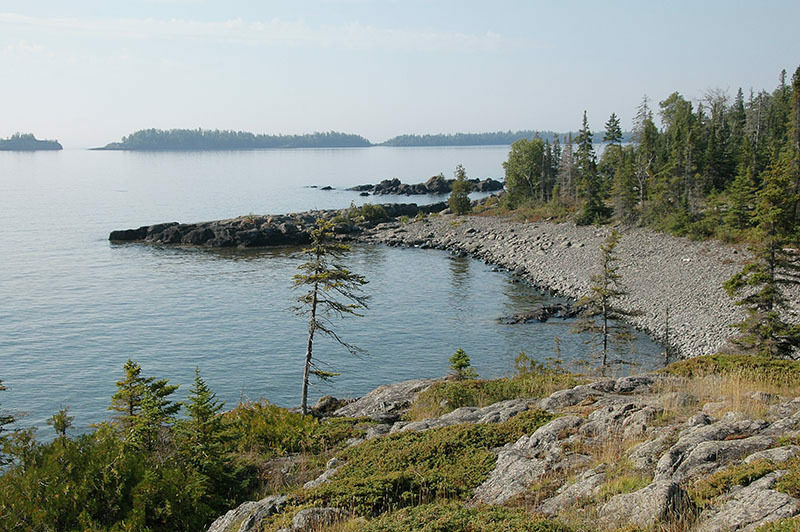 The trails in and around Rock Harbor and the eastern end of the park offer the most variety of any on Isle Royale. For an afternoon of craggy coastline and pounding Lake Superior surf, the Albert Stoll Memorial Trail travels east of the lodge to the end of Scoville Point. This easy loop of 4.2 miles begins at Rock Harbor Lodge and travels 2 miles east to rugged Scoville Point. The trail winds back and forth between the forest and the shoreline, where craggy bluffs and sharp cliffs are testimony to Lake Superior's power and persistent erosion. 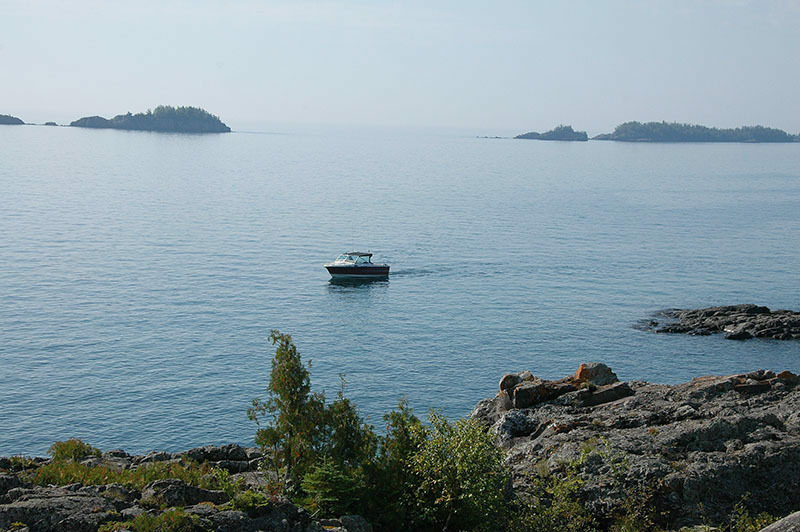 Some visitors to Isle Royale National Park arrive at Rock Harbor and never leave the area. Instead of backpacking they spend their time day hiking, hitting trails during the day with fanny packs and spending the nights in comfort at the Rock Harbor Lodge. They explore only a limited section of the Island but rarely run out of places to hike or things to see. 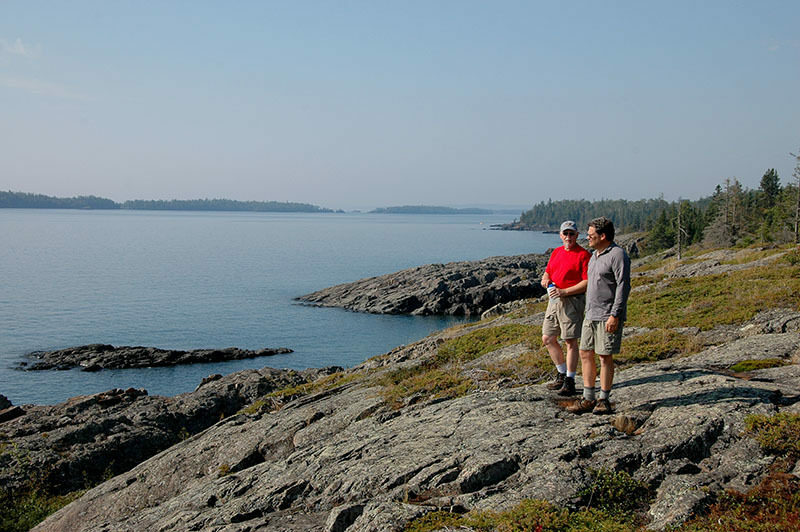 The trails in and around Rock Harbor and the eastern end of the park offer the most variety of any on Isle Royale. For an afternoon of craggy coastline and pounding Lake Superior surf, the Albert Stoll Memorial Trail travels east of the lodge to the end of Scoville Point. This easy loop trail begins at Rock Harbor Lodge and travels 2.0 miles east to rugged Scoville Point. The trail winds back and forth between the forest and the shoreline, where craggy bluffs and sharp cliffs are testimony to Lake Superior's power and persistent erosion. The point is named after an 1840’s copper prospector and is a mix of craggy rock shoreline, juniper brushes and a few scraggily pines. It’s a beautiful spot where you can sit on the rock bluffs, soak in the sun and watch the boaters and kayakers pass through on their way to Rock Harbor. 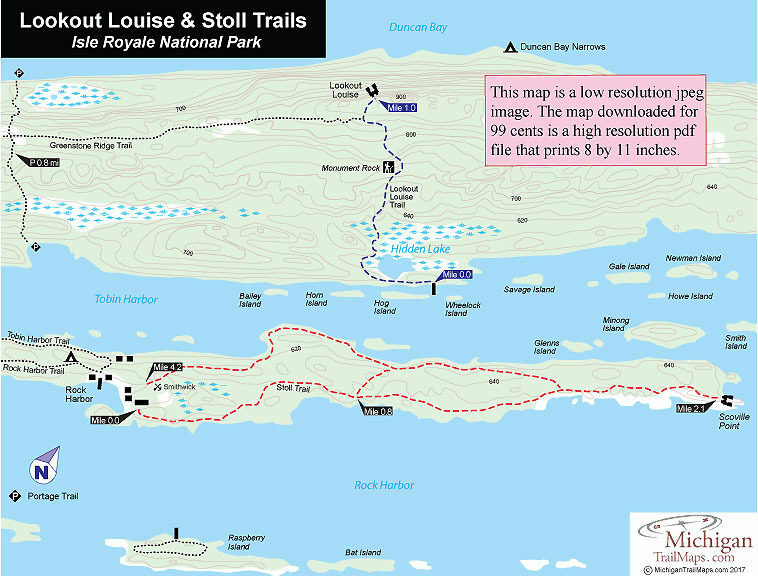 Stoll Trail is covered with detailed maps in Isle Royale National Park: Foot Trails & Water Routes by Jim DuFresne. To order the 184-page guide to the wilderness island, Click Here. Shower tokens, clean towel, and bar of soap can be purchased at the camp store at Rock Harbor. You can book a room at Rock Harbor, either at the lodge or in one of the housekeeping units that can be shared by six people and feature small kitchenettes. For reservations, contact the park concessionaire, Forever Resorts (866-644-2003 or 906-337-4993 in summer; www.isleroyaleresort.com). Isle Royale National Park opens April 16 and closes on Nov. 1 to all visitors for the winter. The park has a entrance fee of $7 per person per day or an annual pass for $60. You can pay the entrance fee once you arrive at the park or in advance at at pay.gov and avoid congestion and long waits on the island. All park visitors who plan to camp overnight at campgrounds or cross-country sites are required to obtain a camping permit. This permit can be obtained free of charge at the visitor center at Windigo or Rock Harbor when you arrive or on board Ranger III on the way to the Island. To reach Rock Harbor and Isle Royale National Park there's the Isle Royale Queen IV (906-289-4437; www.isleroyale.com), a ferry that departs from Copper Harbor.